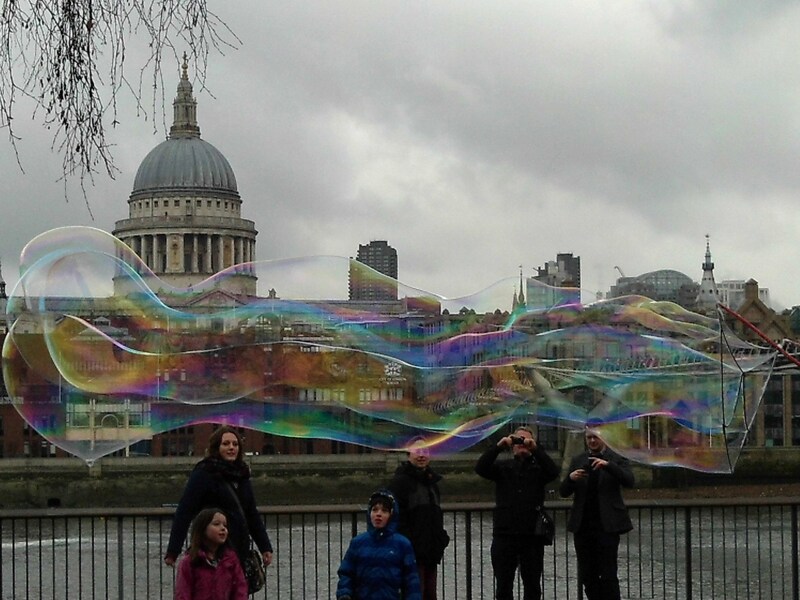 St. Paul’s as seen through multi-colored bubbles. I’m a bit buzzed myself. Having just returned from travelling solo to London and not blogging while I was there, I have a lot to say and question. My head whirls with possible blogs, and it is hard to pick and choose how to order my impressions. Coming from Westcliffe– a small ranching mountain town in Colorado- I live just two blocks from Main Street. Within a five-block radius, I can walk to the library, the grocery, the courthouse, and the clinic. During the winter when all the part-time, resident snowbirds have flown to warmer climes, it is not unusual to see no one on my walk to town or down Main Street itself. High density and the hubbub that comes with city living is not a problem when I am home. 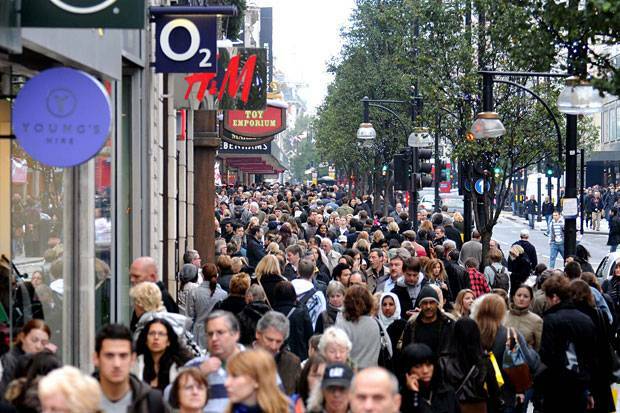 Oxford Street – so crowded during the Christmas holidays, that the sidewalks on alternate sides of the street are one-way and window shoppers are instructed to keep left so as not impede traffic. 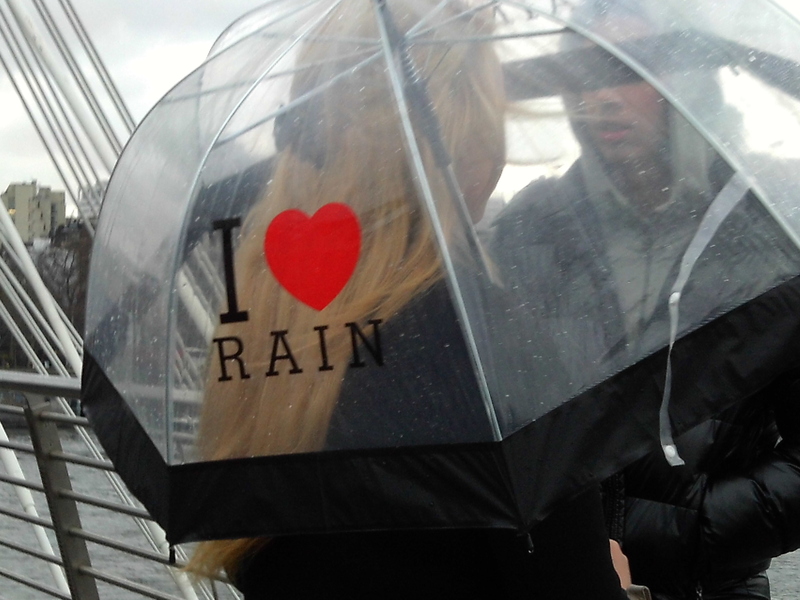 In contrast, London is a boom town, vying with New York City to be the financial capital of the world. Everywhere you look, the city is on the move. Construction cranes stick their necks high above the surrounding buildings. 24-story buildings are torn down to make room for 50-story buildings. Walking shoulder-to-shoulder and hip-to-hip through Tube stations or down main thoroughfares, you are caught mid-stream – no need to walk – pick up your feet and be carried along with the roiling, rolling river. Always great preservationists of the past, England goes to great lengths to hang on to its history and restore buildings worth keeping. 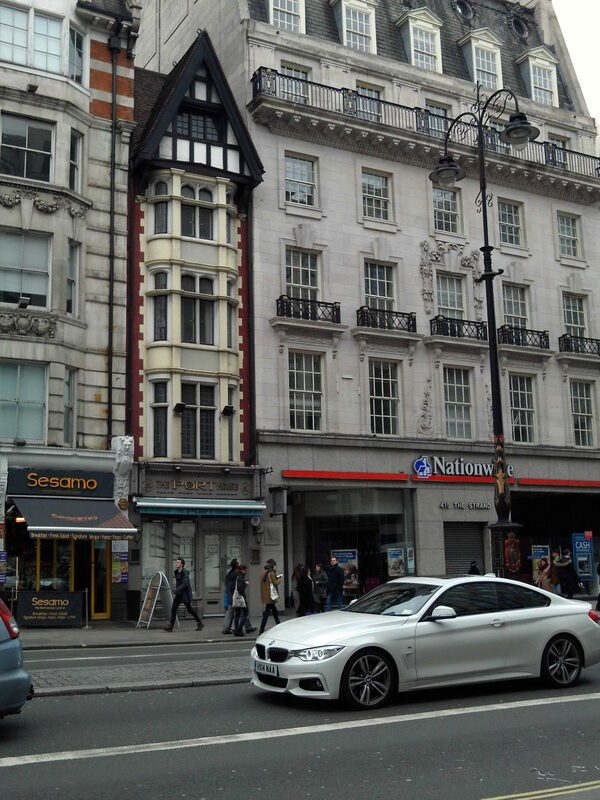 I love the old buildings squeezed in between the newer buildings. 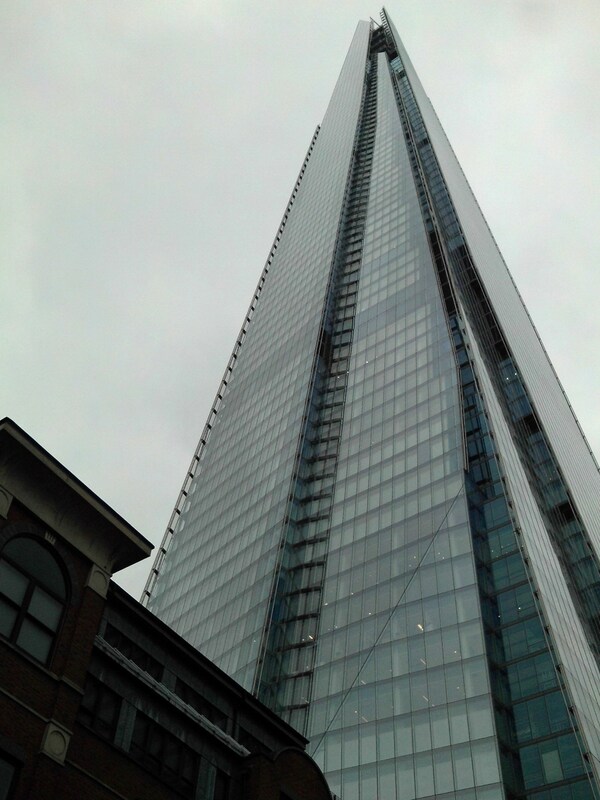 With Crossrail, a new, 13 mile, twin-bore, east/west subway through Central London, a building boom is taking place. If it isn’t new, it is improved. A valiant effort to stabilize a façade while constructing a core behind. 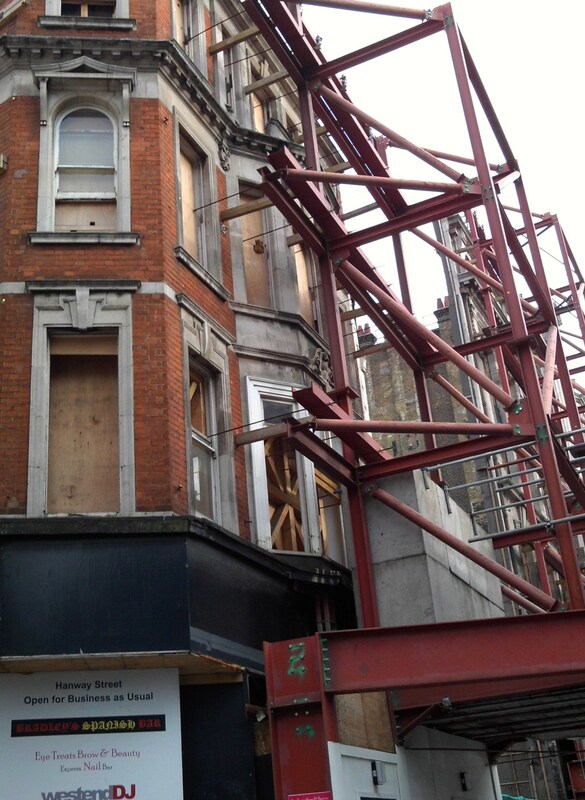 Most curious of all, are the numerous buildings along Oxford Street that are under construction. In many cases, the original facades of the prior buildings have been saved to face the new buildings being built behind. I love the juxtaposition of the new and the old. I remember some years ago the brouhaha over the building of The Scoop– a thousand seat, sunken amphitheater- and glassy City Hall. The Scoop and City Hall are just across the Thames and opposite the iconic Tower Bridge from the late 1800s and The Tower of London from the late 13th century. 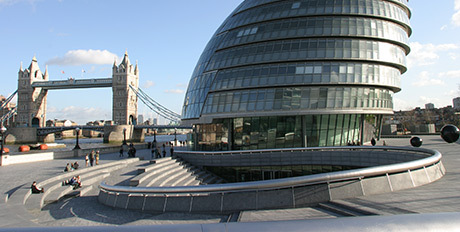 The Scoop and City Hall with Tower Bridge behind. The classicists were horrified. How, they wondered, could the city bring down the neighborhood with contemporary architecture so out of keeping with surround? Not long after the completion of the project I remember watching Antigone, I think, in the amphitheater. The night air was soft; the stars were bright. Lights outlined the framework of Tower Bridge; floodlights lit the Tower of London. The lights and the juxtaposition of a Greek tragedy against the background of historical London against the elliptical glass building adjacent to the Scoop brought each into sharp relief. Instead of seeing more of the same, the contrasts highlighted the strengths of the others. This entry was posted in Uncategorized and tagged " Westcliffe CO, CrossRail, historical preservation, London, London City Hall, St. Paul's, The Scoop, Tower Bridge, Tower of London Antigone. Bookmark the permalink.